Mornings can be a pretty crazy time around here. I try to get up and start my coffee before the baby and toddler wake up, but most mornings I'm awoken by the sound of little feet kicking the wall and babbling to themselves. As soon as my feet hit the floor, we are moving- getting diapers changed, bottles filled, waking up the big kids for school, and figuring out where everyone is going for the day. We've got one car, so I end up playing chauffeur a lot and have to drive my husband to work and get my elementary school kiddo dropped off (the middle schooler can ride the bus, thankfully). Most days are seriously a blur, and trying to squeeze in breakfast and making sure everyone eats well? That's not usually what's on my mind. I know breakfast is super important though, so I always make sure to keep the fridge and pantry stocked with easy options (IE- things that don't require actual cooking). My big kids have always loved yogurt. 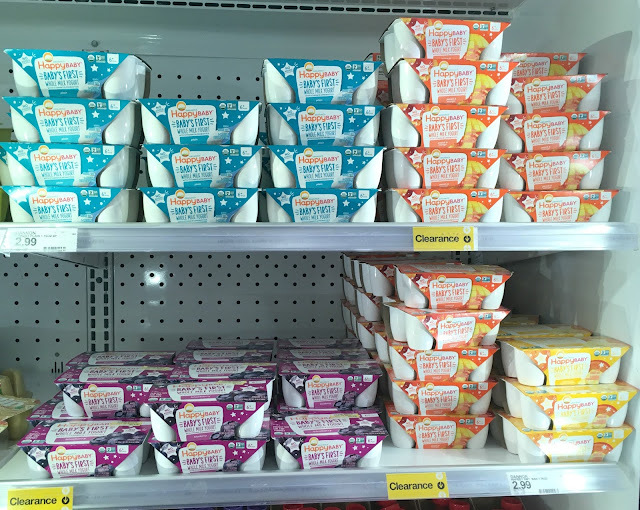 We actually have an entire shelf in the fridge dedicated to yogurt because it's their go-to for breakfast, lunch, and snack time. A little carton of yogurt, some fruit, and a piece of whole grain toast or bagel is the perfect little meal to start the day. The little ones love it too. 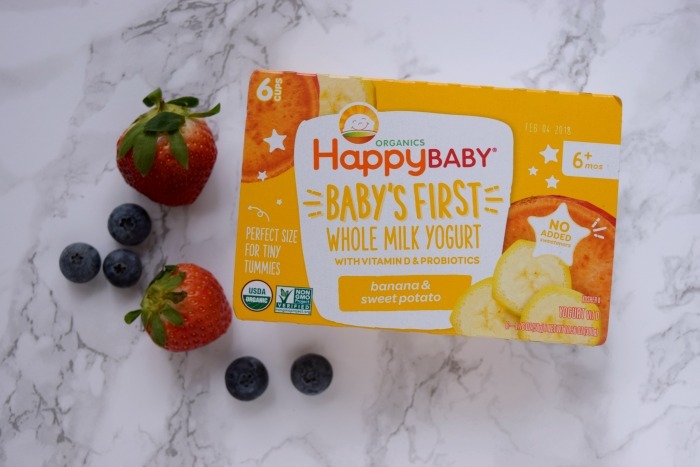 That's why I was thrilled when I saw that one of my favorite baby brands, Happy Family, have their new Happy Baby yogurt cups available at Target! I got an email about Happy Baby yogurt last week, and you better believe we headed straight to our local Target (as if I needed another reason to go. You know it's my happy place!) Guess what? My store had a ton of Happy Baby yogurt on clearance in the refrigerated section, so we stocked up and filled our basket with all of the different flavors. 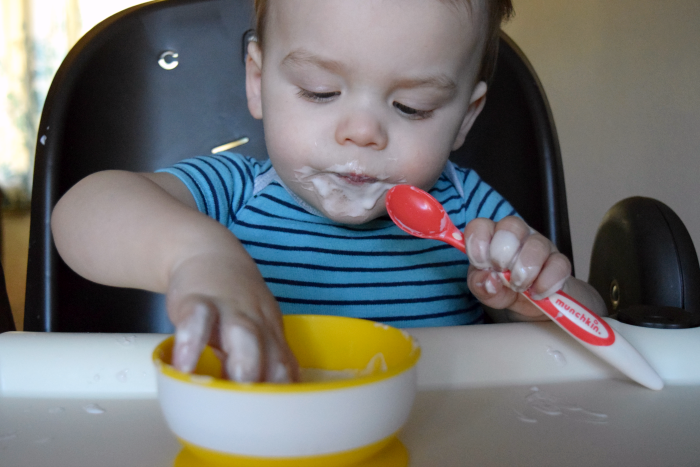 These little yogurt cups are the perfect size for babies 6-18 months old. They're made with whole milk and are full of vitamin D, protein, calcium, and are mindfully made with probiotics. The best part? 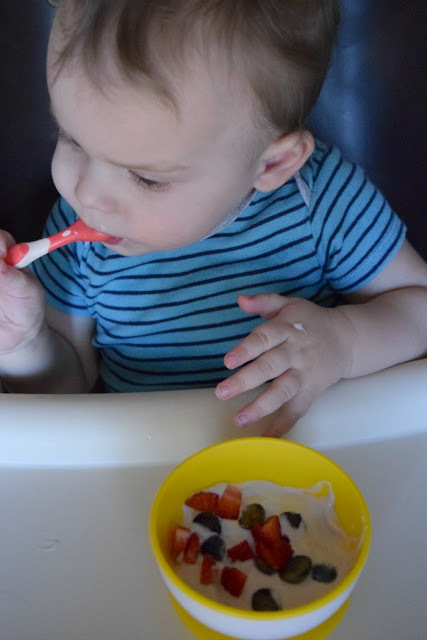 Happy Baby yogurt is non-GMO and doesn't have any added sweeteners. It's naturally sweetened with organic fruit and veggie purees- so there's no added sweeteners in them at all. We grabbed three different flavors, and so far I think the banana sweet potato flavor is my son's favorite. 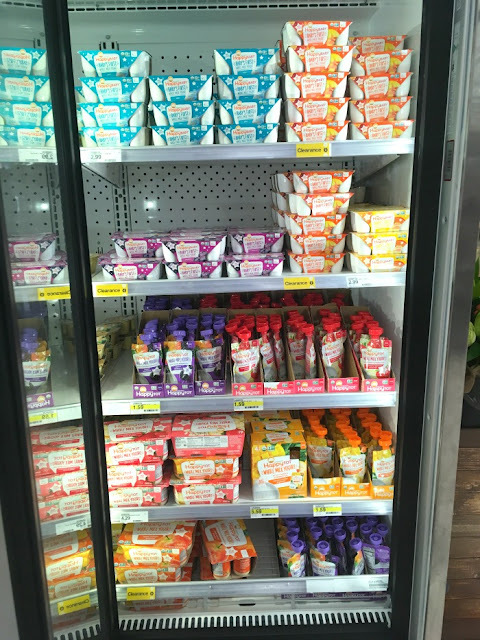 You can also find peach & mango, blueberry, and plain options at your local Target store. Pro tip-check the clearance section in the refrigerated area and grab some that may have been marked down. Ours were only $2 each! Baby boy loves berries. He practically lives off of strawberries and blueberries, so I tried adding some (cut very small) to his bowl of yogurt and let him try to feed himself. 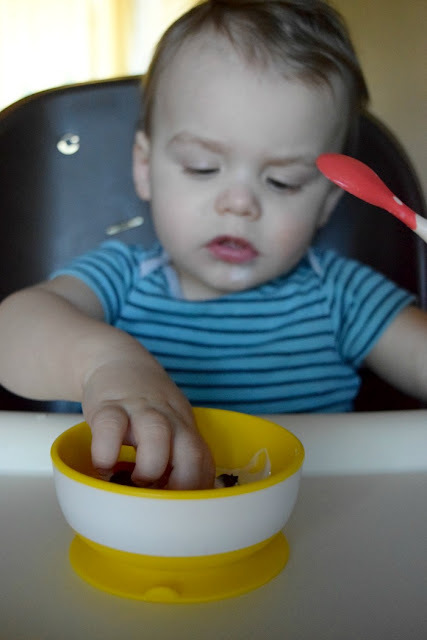 He's not very good with the spoon, so he usually ends up picking the chunks of fruit out and then scoops up the yogurt with his fingers. He gets most of it in his mouth though, so that's all that counts, right? 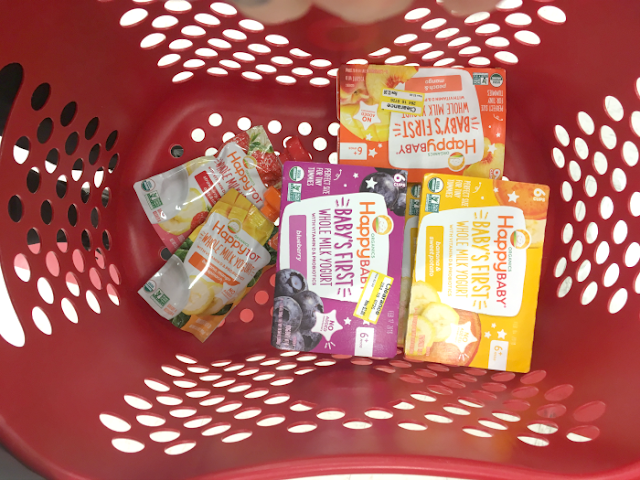 The next time you're at Target make sure to check out all of the Happy Family yogurt products for your baby or toddler. They have lots of options for your little ones and Happy Family is a brand I've trusted for years. I'm always happy with the quality and price, and of course the fact that I can get all of their favorite foods at my favorite store! I mentioned earlier that the main theme of my 2018 goals center around self care and taking care of me first for a change. Diet and exercise have been on the back burner for me for years. It's time to make some changes and get healthy, and food has a lot to do with it. Having four kids in the house can make it kind of tricky to eat well, since we tend to gravitate towards quick, easy, and inexpensive snack options to keep the little ones happy. I have a really hard time spending extra money from our food budget on specialty items for myself, regardless of how good they are. 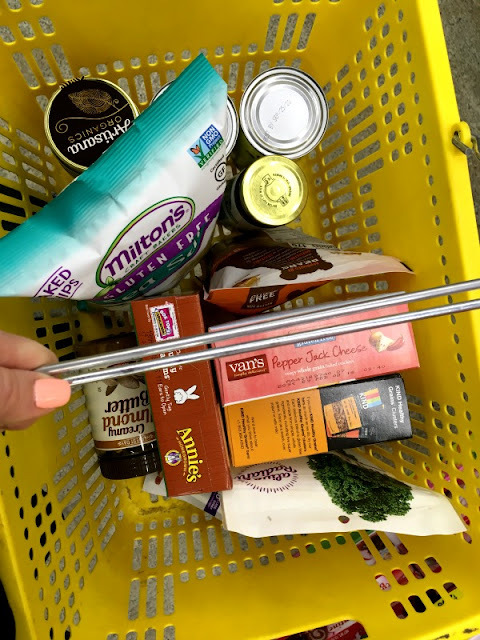 A recent (childless) trip to my local Grocery Outlet showed me that healthy options don't have to be expensive though. I snuck away during nap time to find some mom-friendly snacks. 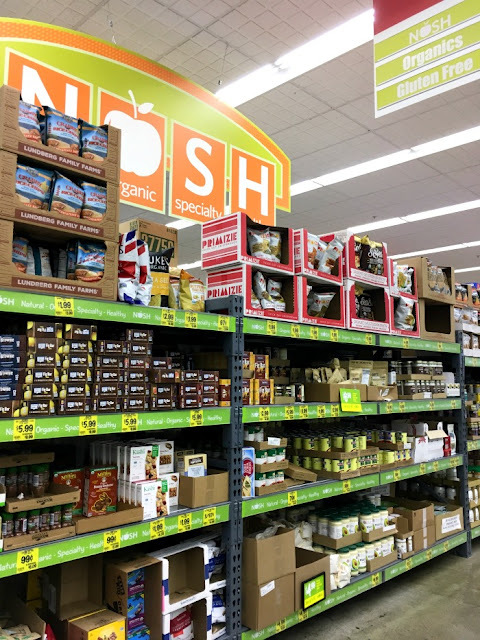 I headed straight for Grocery Outlet's NOSH section- organic, natural, healthy, & natural foods. I had no idea that Grocery Outlet had a selection like this, or that I could save 40-70% by shopping here. I browsed the aisles and found quite a few things I'd normally spend much more on at my other store. For example- this tahini, a specialty item needed to make your own hummus, is normally $12.99 (and you really only need a teeny bit of it). 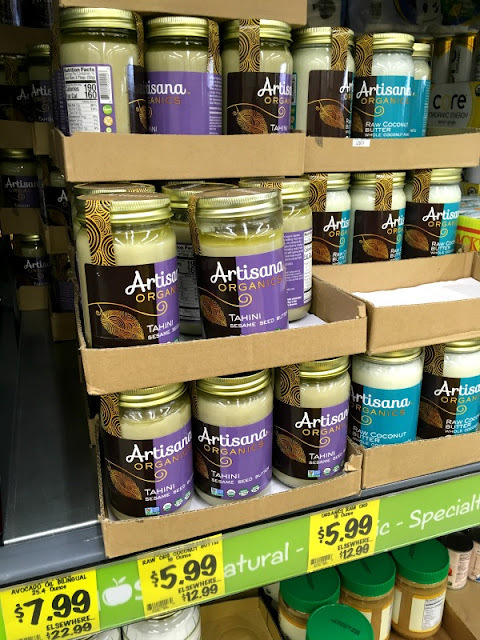 This jar of tahini is was only $5.99 at Grocery Outlet! Along with that I also found the organic garbanzo beans for my favorite hummus recipe as well, and some yummy, healthier "chips" to dip in it. All for such great prices. 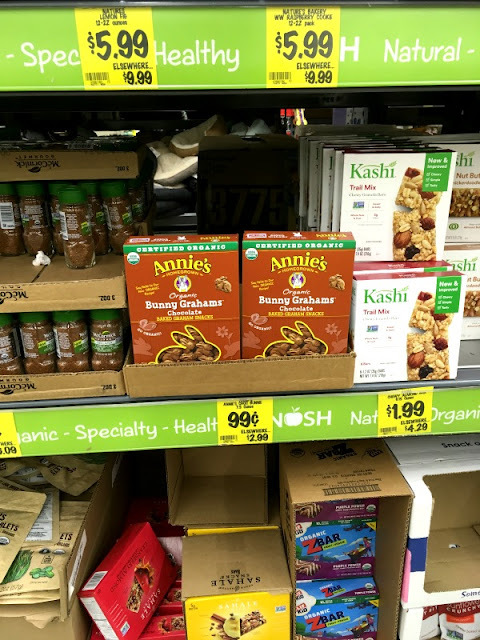 I also found one of our toddler snack time favorites- Annie's chocolate bunny crackers, for only $.99! That was too good to pass up, and I like those too. 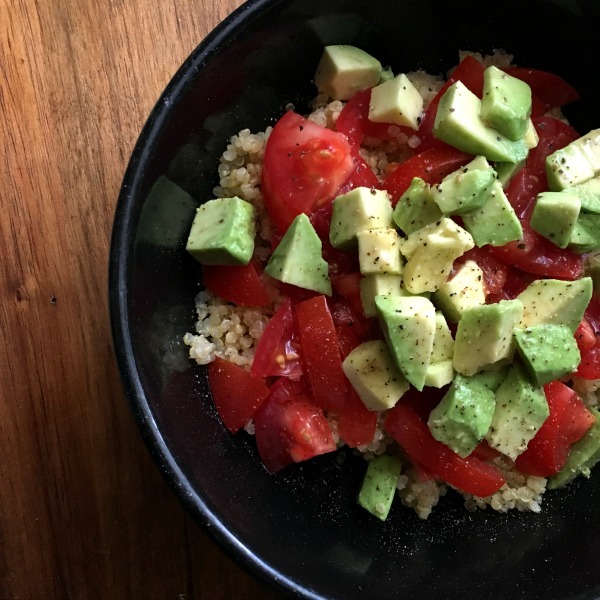 Quinoa- a dinnertime staple in my house, was about half the price I normally pay. 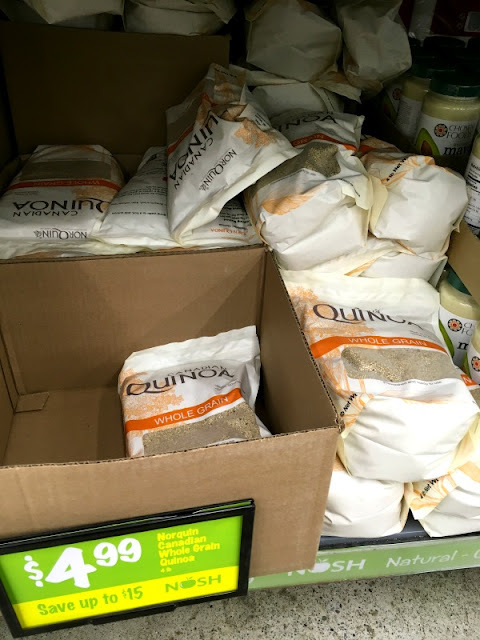 I grabbed a big back to stock up and I'll have to remind myself to always come here for quinoa. We eat tons of it! It's a great side dish or salad addition. I love to throw it in a rice cooker and steam it with some chicken or vegetable stock for flavor. Then I top it with diced tomato and avocado, a little lime drizzle, and some salt and pepper. So good! I eat it as is or sometimes I'll throw it on top of some romain lettuce for some crunchy lettuce wraps. Not a bad little healthy haul, and I will definitely be back to Grocery Outlet now that I know what kind of stuff I can find there for so much less. Though I have heard though- if you see something you love, stock up because it might not be there next time. Check your local circular and snag this $3 off coupon now! Seriously though- give it a try and see how much you can save! Eat better. My diet has been pretty much crap since Josiah was born. At first I was nursing, so of course I was eating like a horse and had plenty of excess fat to lose from my body. Within a couple of months though, I was back to my old habits of coffee, coffee, coffee all day and I'd subsist on mostly toddler snacks. Fishy crackers, string cheese...you know the drill. Most days I'd experience major caffeine crashes and be completely exhausted. Well, it doesn't take a genius to figure out why. My body hasn't been properly fueled in I don't even know how long. This last week or so I've really tried to eat more. I've been doing a green smoothie every morning to get some green, leafy veggies in and I just started adding some protein powder to it too. It fills up my stomach and helps me make better snack and lunch choices later in the day. Move my body. Exercise has been pretty nonexistent in my lifestyle for years. Sure, I'm skinny. I don't need to lose weight. But I have the upper body strength of a kitten and I'm pretty sure I've got about zero muscle tone. And just because I'm not overweight doesn't mean I'm healthy- I know I need to do something to get moving and get my heart rate up every now and again. I have a stair-stepper and I've been making it my goal to use it every other day. Even just 20 minutes gets me panting and sweating. My goal is to keep up with that at the very minimum and to add some kind of strength training to it as well to tone up. Oh, and I'm dying for spring to roll around so I can get back to walking with my double stroller- the one form of exercise I actually enjoy! Make better use of my time. This year I'm going to try to simplify and make better use of my time. 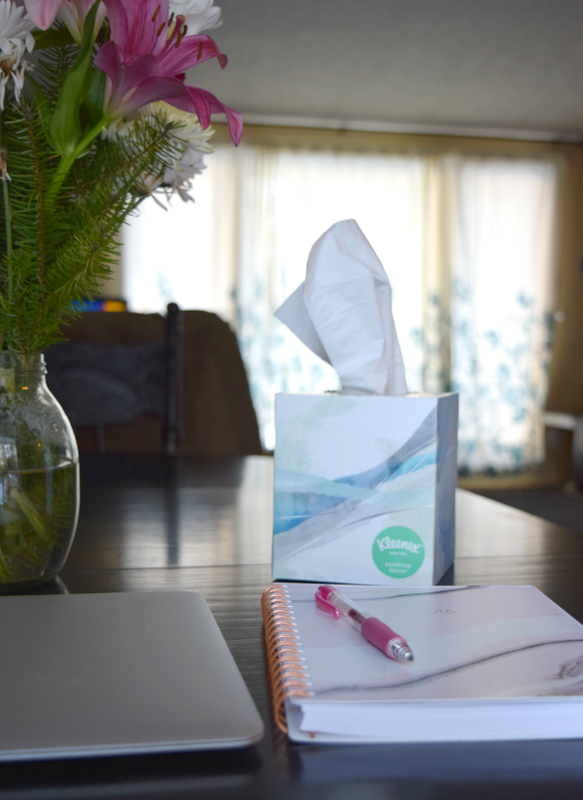 Embracing technology helps so much with this one- I love stocking up at Walmart.com & using their free 2 day shipping feature. I've streamlined my errands by ordering what I can online and stocking up when things are on sale so I'm not running out at the last minute for basic necessities. Most of them are delivered right to my door now. 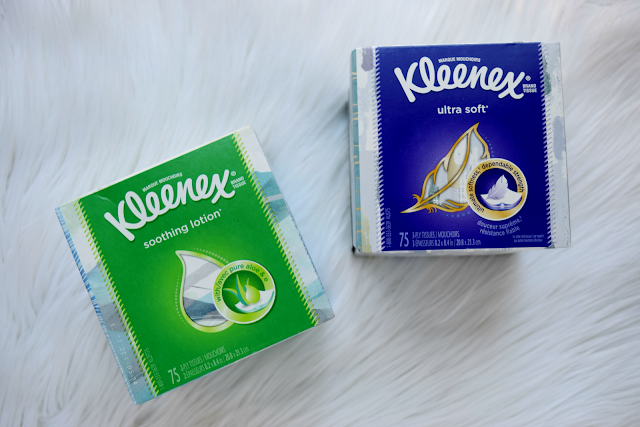 Right before Christmas I stocked up on these Kleenex tissues- a staple in our house during cold and flu season and beyond. I've got 4 little noses to wipe, and these are our favorite. (They have a special layer in the middle to trap and kill 99.9% of cold & flu viruses in the tissue within 15 minutes!) I've even started doing my grocery shopping online...I just order and pull up at the store. I don't even have to get out of the car with all of the little ones anymore. So convenient and it saves me so much time and stress. Find out how to get free 2 day shipping or free store pickup here- it's a life-saver for sure! Rest when needed. It's hard to admit that you can't do it all 24 hours a day, 7 days a week. Mom life can be rough, but rest is essential. I'm going to stop feeling guilty about this one and put my feet up when I need a little breather. Do things I enjoy. I realized that in 2017 I didn't really do anything that I really love to do. I didn't read a book. I didn't do any crafting. My sewing machine went completely untouched. 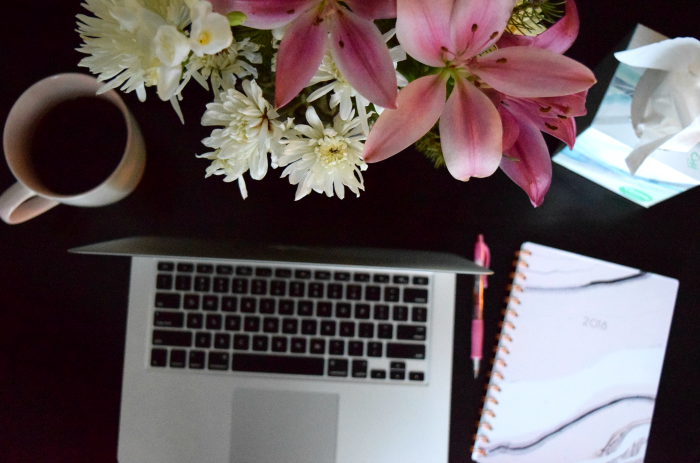 I didn't do a whole lot for myself, besides the occasional blog post and what I was doing to run my new business. I kept myself busy doing a lot of busy work, but I didn't do any of the things that used to really make me happy. That is going to change! Those 5 little things are going to hopefully make me a better me in 2018. This is going to be the year I prioritize myself, my health, and my happiness a little more. What are you doing to take better care of yourself? Do you have any big goals for the new year?